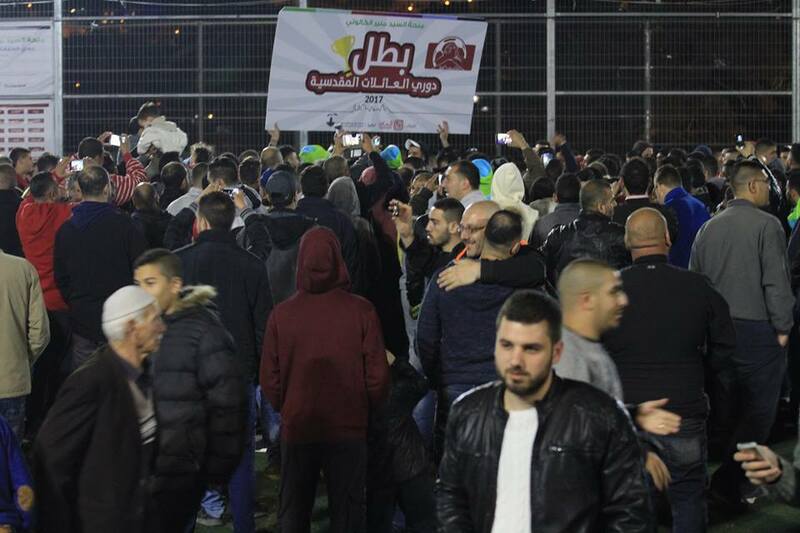 Abu Sneineh family team won the Jerusalemite Families Tournament after beating Abu Kaff family team in the final game of the tournament on Saturday 1st of April 2017 on Burj Al-Luqluq football field, within Shababek Ya Quds project that is funded by the Jerusalemite businessman Munir Kalouti and supervised by the Welfare Association. Around 2000 came to watch the final game which is considered one of the most important events inside the Old City of Jerusalem. Muntaser Edkaidek, Burj Al-Luqluq Executive Manager, and Nihad Zughayyer, the head of Burj Al-Luqluq physical education department, welcomed the everyone who came to attend this amazing event. It is worth mentioning that the tournament held the title of “We’re the Owners of the Land” and it went on for two months in the aim of keeping a good relationship among the Jerusalemite families.